the original PS2 launch models (SCPH-10000, SCPH-15000, and SCPH-18000) were only sold in Japan, and lacked the expansion bay of current PS2 models. These models included a PCMCIA slot instead of the expansion bay port of newer models. SCPH-10000 and SCPH-15000 did not have a built-in DVD movie playback and instead relied on encrypted playback software that was copied to a memory card from an included CD-ROM. (Normally, the PS2 will only execute encrypted software from its memory card, but see PS2 Independence Exploit.) V3 had a substantially different internal structure from the subsequent revisions, featuring several interconnected printed circuit boards. As of V4 everything was unified into one board, except the power supply. V5 introduced minor internal changes, and the only difference between V6 (sometimes called V5.1) and V5 is the orientation of the Power/Reset switch board connector, which was reversed to prevent the use of no-solder modchips. V7 and V8 included only minor revisions to V6. Assembly of the PS2 moved to the People's Republic of China during the development of V9 (model numbers SCPH-50000 and SCPH-50001). The upgraded console added an infrared port for the optional DVD remote control, removed the IEEE 1394 port, added the capability to read DVD-RW and DVD+RW discs, added progressive-scan output of DVD movies, and added a quieter fan. V10 and V11 were only minor revisions to V9. The PS2 standard color is matte black. Several different variations in color have been produced in different quantities and regions, including ceramic white, light yellow, metallic blue (aqua), metallic silver, navy (star blue), opaque blue (astral blue), opaque black (midnight black), pearl white, Sakura purple, satin gold, satin silver, snow white, super red, transparent blue (ocean blue) and also Limited Edition color Pink which was distributed in some regions such as Oceania, and parts of Asia. The small PlayStation logo on the front of the disc tray could be rotated ninety degrees, in order for the logo to be the right way up in both vertical and horizontal console orientations. This feature is also used in the slimlines. 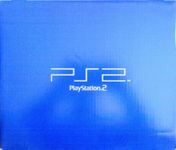 PlayStation 2 Slimline In September 2004, Sony unveiled its third major hardware revision (V12, model number SCPH-70000). Available in late October 2004, it is smaller, thinner, and quieter than the older versions and includes a built-in Ethernet port (in some markets it also has an integrated modem). Due to its thinner profile, it does not contain the 3.5" expansion bay and therefore does not support the internal hard disk drive. It also lacks an internal power supply, similar to the GameCube, and has a modified Multitap expansion. The removal of the expansion bay has been criticized as a limitation due to the existence of titles such as Final Fantasy XI, which require the use of the HDD. The official PS2 Linux also requires an expansion bay to function. Currently only the modified Multitap is sold in stores, however these are also compatible with the older versions, and also added support for multiple memory cards on some games. Third-party connectors can be soldered into the unit giving hard drive support, however IDE connections were completely removed in the V14 revision, thereby eliminating this option. Certain mod chips enable the use of a USB hard drive or other mass storage device.